Universal Application; 21.5 inch Dual Row LED Light Bar. Equip any vehicle with a dual-row LED Light Bar by RT Off-Road. The body of each lamp is constructed of durable die cast aluminum with a polycarbonate lens. The 40 Phillips LED’s in each lamp produce 7200 lumens at 120 watts, resulting in an impressive amount of light without the need to upgrade the charging system of the vehicle. Matte black anodization, an IP86 rating, and a 50,000 hour LED bulb life means that these lamps are designed to last, even in the harshest conditions. 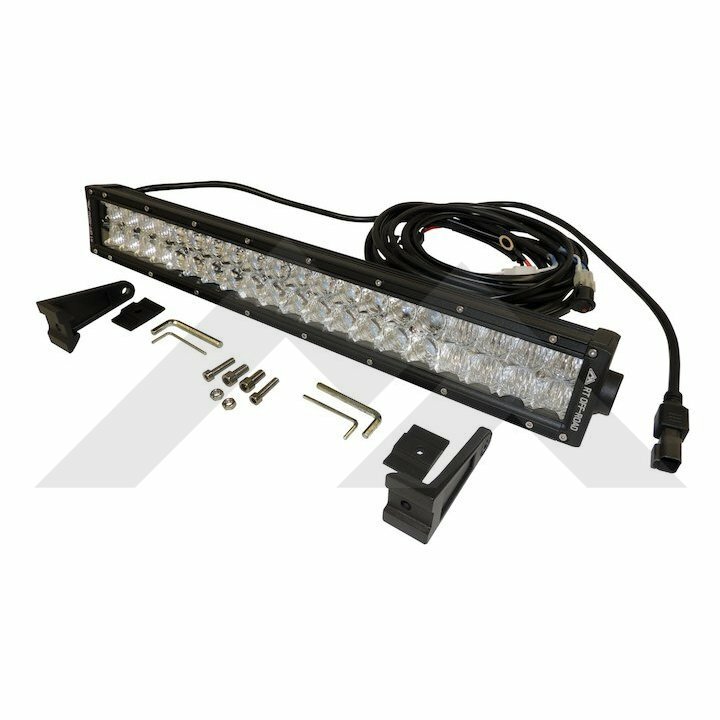 Included is a light bar measuring 21.5" x 3.5" x 3", universal mounting brackets with stainless steel hardware, and a full wiring harness with waterproof Deutsch connectors, a 40 amp relay and a switch.